She is now dressed up in her Easter Finery. Since my Living Room is peach, Minerva has peach accessories to accent her beautiful lace dress. She looks very Spring like, doesn't she? Yes, I have an uplight under Minerva's dress so she glows at night!! I will be posting more of my Easter decorations in my next post!!! This past year, I have gotten a kick out of changing Minerva's accessories for different Holidays!!! Here is Minerva all dressed up in her Valentine's Day attire!! Her red beaded sash is actually a table runner!!!!! Look! Someone has given her a box of chocolates!!! And you know I have to show you her at night!! Now at Halloween, Minerva was transformed into a Witch!!! Well, sort of a skeleton Witch!! She is a bit scary looking, isn't she????? Has her accessories changed this time!!!!! But she still has her pearls!!! A Lady can never be without her pearls, can she???? And her brooch is actually a Halloween ornament! I think Minerva will be celebrating the Patriotic Holidays this Summer by wearing Red, White and Blue!! Victoria is a sewing dress form that I bought several years ago for $1.00!!! Yep, that is my Wedding Gown from 1978!!! I bought Rose through the link that Carol has provided at the Ball and I truly intended to have Rose prettied up but time got away from me. 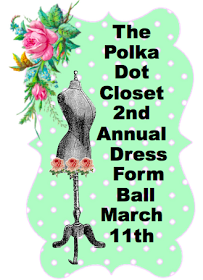 So I will be getting ideas on how to finish Rose from all of those that are participating in the Dress Form Ball!! So are we ready for the Ball???? ?